Dont Stay In The Tank... Call Jim Frank! If a loved one has been arrested, your first priority is to locate them in the legal system and find the facility where they are being held. Not having information about a loved one who is incarcerated can be devastating. As a provider of bail bonds services, Jim Frank Bail Bonds with more than 30 years of experience, one of the first ways we can help you is by locating your loved ones within the correctional system. We work with our clients to provide transparency, help them know exactly what is going on with their loved ones who are behind bars, and go the extra mile for all of our clients. One of the most helpful resources we share with our clients is VINELink. 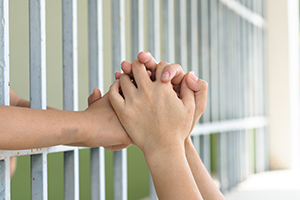 It’s difficult to receive real-time updates from a loved one who is locked up. Before you know it, they could be transferred or their court dates could be changed. Mail may not reach them in time to learn more about their status, so friends and family members of defendants are often left in the dark. VINELink can also confirm if in fact your loved one has been locked up, as well as their current location. You can also use VINELink services to find out more information on the jail bail bonds and posting jail bail. The information on VINELink is updated every 15 minutes for jails and twice each day for prisons. This may vary depending upon activity at the jail or prison and the resources the facility has on site to update the data. The information below shows all correctional facilities in Maryland, their location, and details on visitation. If your loved one is currently held in one of these facilities, contact us today at 301-416-8148 for Maryland and 717-977-3215 for Pennsylvania.